But the problem is that each of us does have our own “facts”. The world is a complex place where facts are often contradictory and open to interpretation, and we (all of us) tend to interpret facts in a way that reinforces our pre-existing beliefs. When I studied group dynamics as part of my MBA, this was referred to as the “Confirmation Bias” and I saw it in all aspects of my life. Think about it. How many times have you been debriefing an event or a meeting, and the people you are talking to seem to have been somewhere else. They didn’t see or hear the things you did, and they saw and heard things you didn’t. That’s the confirmation bias at work. We believe information that is consistent with our beliefs and reject information that is inconsistent with our beliefs. And that’s when facts are reasonably well established and clear. But what happens when the facts are contradictory? Look for example at the polar ice caps. 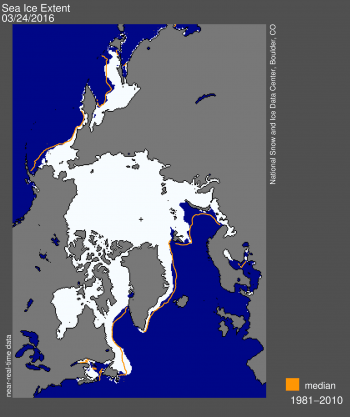 Arctic Ice is in clear retreat. The 2016 maximum extent is the lowest on record. OK – That seems clear. But Antarctic sea ice is growing, in fact last year it hit a record high maximum extent. So what’s up? Well, the truth is that no one is sure. 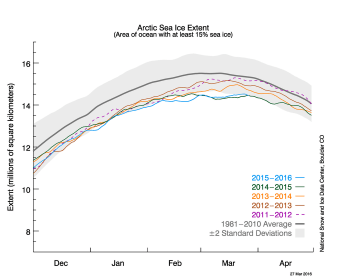 Now, to be clear, when you add arctic and antarctic sea ice, there is an absolute decline. Even so, the increase in Antarctic ice doesn’t fit our current models, and people who want to use this fact to cast doubt on global warming can do so. Polarization on climate change risks is strongest in countries where a contrarian social movement funded by fossil fuel and related interests has been most active in raising doubts about the scientific consensus10, 11, 12, 13. Polarization seems to depend not only on individuals’ stable values or world-views, but also on organized influence attempts, which have proved most effective with receptive subpopulations holding particular political and social values. In the US, where these influence attempts are strongest, polarization has increased over time, affecting mainly political conservatives6. It is worth noting that many contrarian arguments generate mistrust of mainstream climate scientists10, a strategy that past research suggests affects risk perceptions14. And we know that in the U.S. there has been a lot of money spent to raise doubts about climate change. Exxon Mobil was actively involved in spreading skepticism about global warming while making plans for how to respond for their advantage.